JACKSONVILLE, Fla. - Likening the November election to “reclaiming America’s soul, for real,” former Vice President Joe Biden held a crowd of supporters spellbound Monday as he shared a stage with Florida’s top two Democratic candidates as early voting started in many parts of the state. Afternoon rallies and the University of North Florida and the University of South Florida followed a nationally televised debate Sunday night between Gillum, who is seeking to make history as the state’s first black governor, and Ron DeSantis, a former congressman who parlayed his endorsement by President Donald Trump into a decisive Republican primary victory in August. Biden joined Gillum and Democratic U.S. Sen. Bill Nelson onstage in South Florida, delivering a speech in which he hammered President Donald Trump, DeSantis and Gov. Rick Scott, who is trying to unseat Nelson. Biden seesawed between painting a frightening picture of the nation’s future if left in Republicans’ hands and a more positive vision if Democrats were to regain control. The former vice president told students at UNF to keep their passionate support for the Democratic party going. The message resonated with Connie Walker, who attended the rally. "Coming to the rally was everything. Point blank. Period. It was an honor," said Walker. Appealing especially to millennials, Gillum is one of the youngest candidates for statewide office. While at UNF, Tallahassee's mayor earned cheers with nearly every sentence. "As proud as I am of being Tallahassee’s mayor, it is my sincere hope that the next time I greet you, I will greet you as the next governor of the great state of Florida," Gillum said. 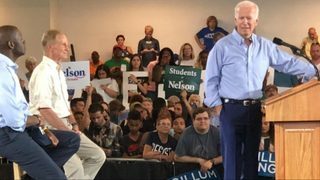 Biden will continue campaigning with Nelson on Tuesday morning. They will attend rallies in Tallahassee and Orlando. DeSantis' running mate, Jeanette Nunez, was in Jacksonville on Monday for a private event at Havana Jax in St. Nicholas. "Jacksonville is a wonderful community, it's a business community, it's an area where we've seen what good policies can do," Nunez said. "We want to make sure we continue to push forward good policies for our economy, for our education, for our environment." Around the time of the event, Clay County Sheriff Darryl Daniels announced his support for DeSantis on Twitter. DeSantis will be in the River City on Tuesday, speaking at the Jacksonville Veteran's Memorial Arena. After campaigning at a church in Orlando and a restaurant in Miami, DeSantis will return to Jacksonville on Thursday with Vice President Mike Pence at the Prime Osborn Convention Center.